Wow! That was a lot of work. Well, there was a nagging hunch before, but you have now removed all doubt in my opinion. At least you admit why you hit up two of the foremost, and prominently visible forums in the vaping community with your agenda. I think a lot of people will take that action to avoid seeing what goes on in this thread. Creme de vape?? Are these original manufactured flavors? Or one shots? Or rebottled rebranded? hey guys not to be a party pooper but im not sure what @Mikser true intentions are, but have you gone back to the beginning of the thread and looked at some of his revisions? maybe i’m being paranoid but it seams slightly off to me. Daap makes your weewee fall off. Lol. Glad I don’t have to worry about that! Note: i added “Kosher” in the table because it is less likely that flavors contain GMOs compared to when companies say nothing at all. It is also more likely that they use palm oil instead of soybean oil for VG (94% of soy is genetically modified in the USA). “Kosher” does not mean non-GMO. “Organic” can still contain a small amount of GMO. “All Natural” doesn’t mean anything at all. I hope more companies will join this GMO-FREE list soon. Not because the law says so, but because the large majority of their customers would wish that. It can be a good marketing advantage. Note: Decadent Vapours (DV) removed their lab reports from their website during the last week, and thus they dropped below in the transparency table. I assume they are preparing new transparent information about DAAP levels in their flavors for their customers. I am loving the information you have been consolidating here! Just wanted to let you know, in purchasing some new flavors recently from NicVape, I found out that they are completely diketone free. 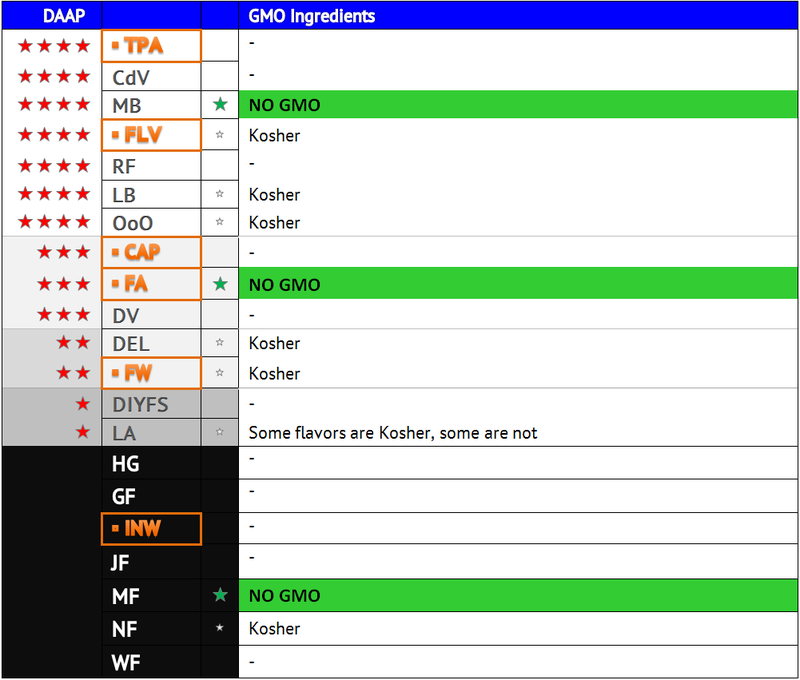 Unusure about GMOs but I did not see them on your table and figured it would be noteworthy. If you have already added this but I missed it, then oops. "NicVape decided to reformulate all of their products, and go “diacetyl acetyl propionyl-free ” using GMP certified sources with flavorings that are independently certified. " No mention of acetoin but it is something at least. Thx Pentine! I will include NicVape in my next update.